UPDATED: 2013 was a huge success. 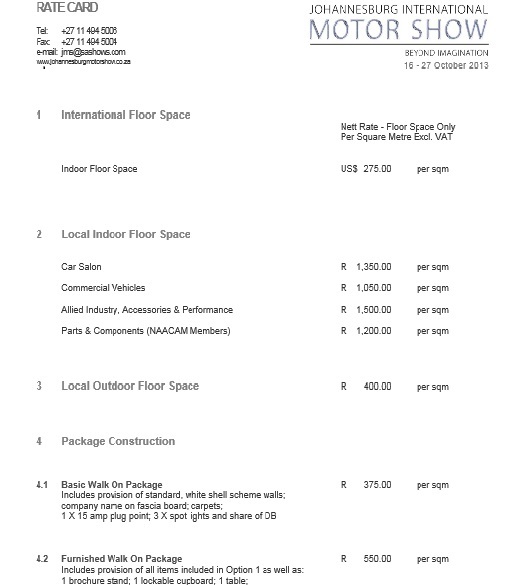 HOTT3D will be on site providing exhibition solutions to clients at The Johannesburg International Motor Show 2013 before, during and after the show. So if you have any exhibition stand, display or graphic needs, please contact us. The Johannesburg International Motor Show 2013 (also known as Joburg Motor Show ex: Auto Africa) is back in 2013 for its bi-annual show to be held at the Johannesburg Expo Centre, Nasrec, Johannesburg. The show is the biggest auto show in Southern Africa and covers multiple auto sectors including: passenger vehicles, commercial vehicles, trucks, performance vehicles, motor cycles and services relating to the auto industry.